Area visible from Derry Lodge. Map made using Ordnance Survey Panorama elevation data in QGIS. You can see a similar visible area analysis for Arthur’s Seat, with a little more description about how it is done. For ease of analysis I grouped the snow cover observations into two groups: 600 m and above and below 600 m. You can see this delineation on the map above. Next I counted how many days per month snow was visible in the two elevation bands. This is a more appropriate measure of snow cover for temperate countries like Scotland as the snow cover tends to be ephemeral meaning many accumulation and melt events through the course of a winter, making maximum snow cover values a little misleading. I chose three different methods to plot up the snow cover. The first (below) looked at snow cover each month. 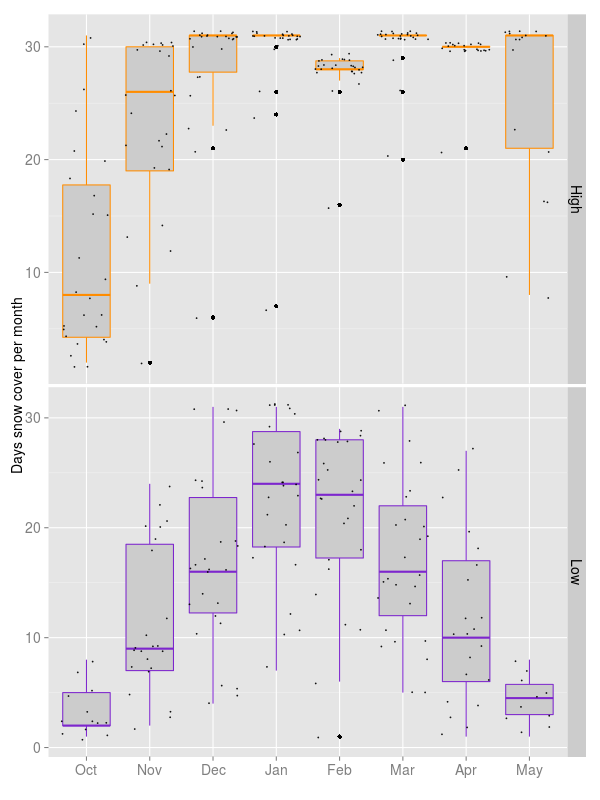 For this I used box plots, where the centre bar indicates the median days of snow cover, the box the 25-75 percentile range and beyond this limits and outliers. I’ve also plotted up the values from each year so we can see how these compare to the percentiles shown. As we expect there is little variation in high level snow cover during the deepest winter months, reflected in the small boxes. The lower elevation plots shows a nice curve of increasing and decreasing snow through the winter. Note that there are 2-3 less days in February than January or March! 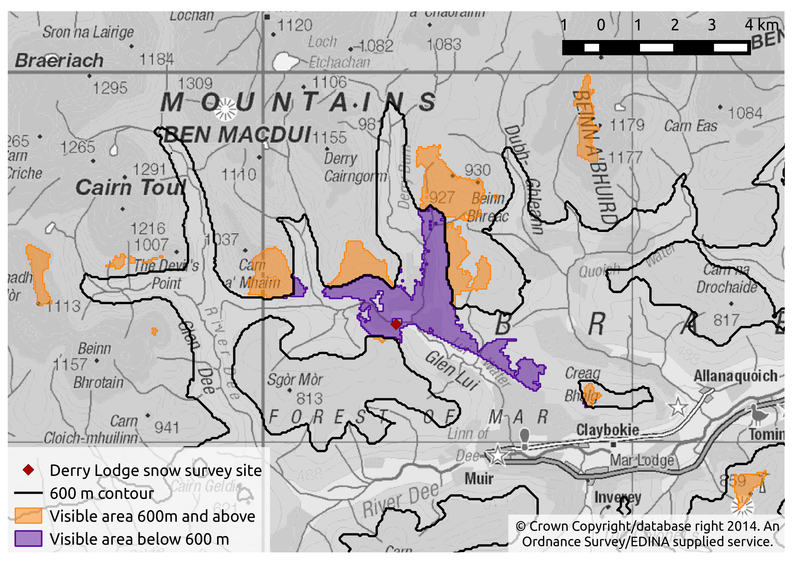 Snow survey observations for Derry Lodge between 1954 and 1984 split between above and below 600 m.
While the box plots show the spread of data each month they do not give an indication of how snow cover changes between winters. For this second method, I plotted up the days snow cover each month through time and fitted them with a lowess smoother and 95% confidence bands to help show trends. 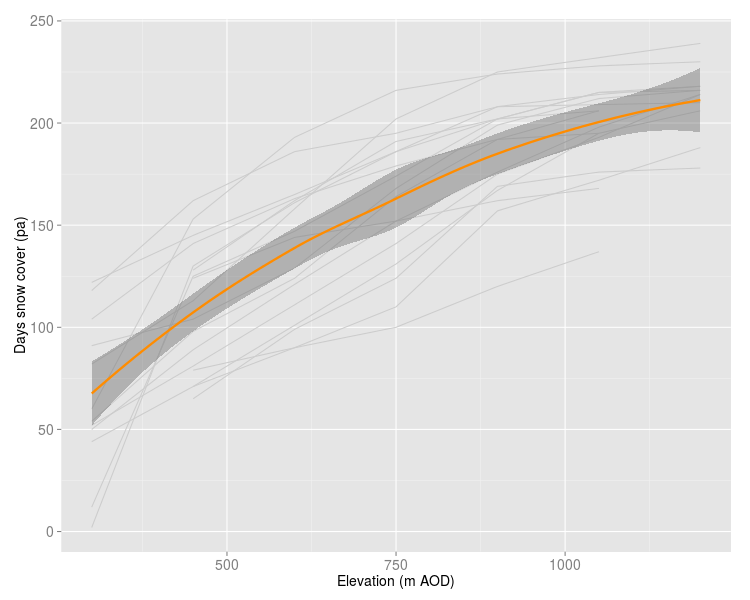 As shown in the box plots there is little variation in the high elevation plots. The low elevation (< 600 m) plots show a reduction in Autumn/Spring snow cover from the late 1960s onwards. Snow survey results for Derry Lodge. Days per month plotted against years, split by time. Finally I extracted only the years which returned 8 months data between October and May, counting up the days each year with snow lying at each elevation. I plotted these as curves showing the days snow cover for a given elevation and overlaid with a general fit (lowess) and 95% confidence limits. So to read the plot: at 500 m elevation you would broadly expect 125 days snow cover per year near Derry Lodge (based on the years sampled). Complete year observations for Derry Lodge (light grey), overlain with a lowess smoother and 95% confidence bands. It’s a shame that Derry Lodge stopped recording in the early 1980s, prior to this the data record was fairly comprehensive and there is no other snow survey site in the Eastern Cairngorms. Adam Watson recorded the snow survey at Crathes Castle between 1979 and 2004, which could potentially be used as a proxy. I have 144 other snow survey sites across Scotland, many with shorter records than Derry Lodge, but some with much longer. I’m exploring the best way to present these data and hope to have a Scottish snow trends paper out at some point in 2015. Watch this space! 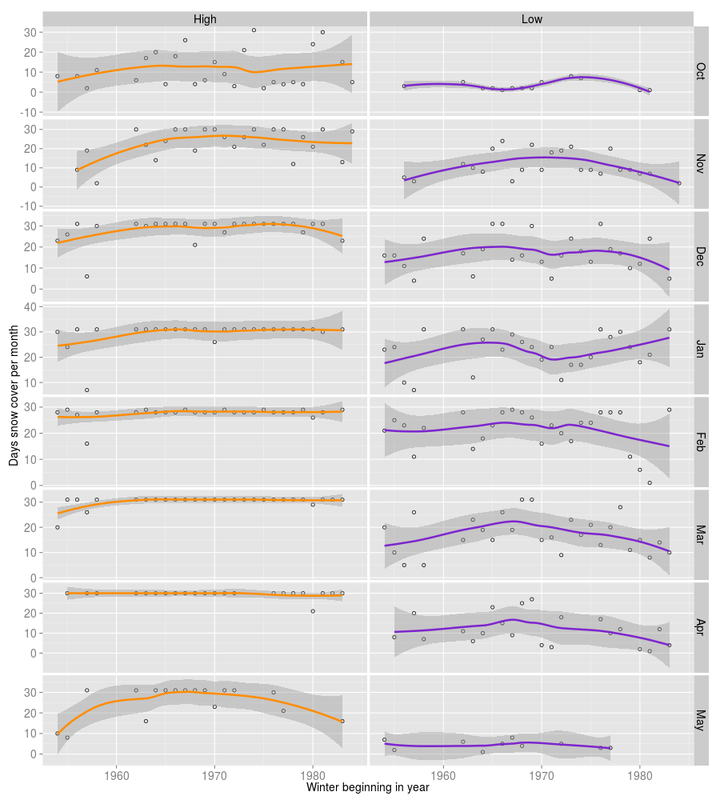 The plots were created in R using ggplot2. I use SQLite to contain my data. To leave a comment for the author, please follow the link and comment on their blog: R – scottishsnow.